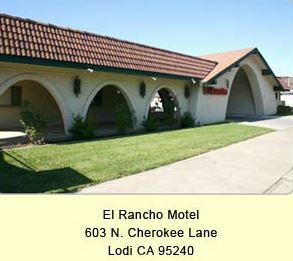 El Rancho Motel – Lodi California – El Rancho Lodi Motel is located 35 miles south of Sacramento and 90 miles east of San Francisco. Lodi California is known as one of Northern California’s new wine country destinations. This motel in Lodi is located within walking distance of restaurants and sports bars. The El Rancho Hotel is located 35 miles south of Sacramento and 90 miles east of San Francisco. Lodi California is known as one of Northern California’s new wine country destinations. This motel in Lodi is located within walking distance of restaurants and sports bars. The Lodi Grape Festival Fairgrounds is a block away as well as shopping centers and entertainment are located within minutes from this Lodi Motel. If you are looking for a budget motel in Lodi while visiting one of the wineries, visiting family, or just need a place to get a peaceful night rest while traveling, then make El Rancho in Lodi your first stop.